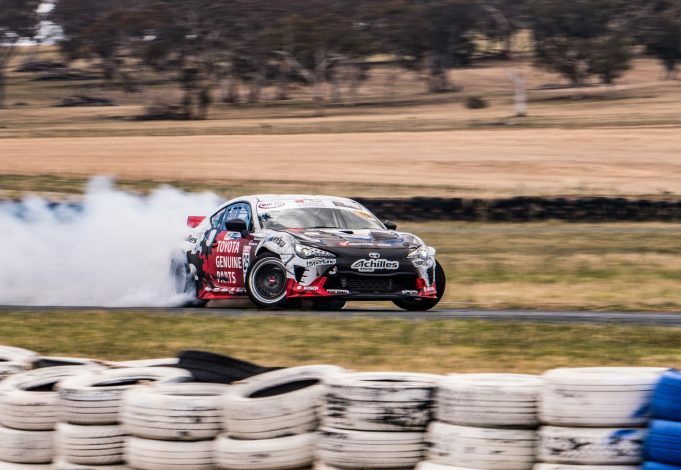 BACKED by Toyota Genuine Parts and steering a heavily modified, thumping 517kW turbo Toyota 86 GT, Beau Yates has won the 2018 Hi-Tec Drift AllStars Series championship title after a sensational season. So good was his season, that the 36-year old from Sydney finished with two wins and a podium finish in every round of the five-round series. But it wasn’t all plain sailing. Going into the final round at Wakefield Park in Goulburn in NSW, Yates was just 43 points ahead of second placed Michael Prosenik ensuring a thrilling battle for the season title. After an intense day of racing, Yates finished the round with a third place taking home 82 points and enough to secure the 2018 championship victory with a winning margin of 33 points. “I would have liked to finish the year off with a better qualifying score and final result but I made it on to the podium at all five rounds of the series and qualified well so I am really happy with the overall results,” Beau Yates said. Yates has been racing drift cars for 15 years and the 2018 Hi-Tec Drift AllStars Series title is his third national championship win in drifting, having previously won the same series in 2016 and the Australian Drift Championship in 2006. “To be able to win a championship after so many years in the sport and to still be so competitive is something I am really proud of,” he said. Yates said the championship win was a great way to top off what has been a very busy year. “We have had another massive year with the conversion of the Toyota Genuine Parts AE86 (Toyota Sprinter) into a competition Time Attack car and ran both it and the 86 GT at the World Time Attack Challenge event in October,” he said. He is now looking forward to 2019 and competing again in the five round Hi-Tec series, the International Drifting Cup run as part of the World Time Attack Challenge as well as being on the lookout for any other drift events to be involved in. “I’ve really got fantastic support from Toyota and the 86 is really performing so well so I’m keen to get it out on the track as much as possible,” he said. THE Toyota Camry is such a well known commodity that each new generation brings with it the expectation of, well, more Camry-ness. It's this stubbornly consistent formula that has made it thoroughly innocuous, and also the best selling car in Australia.